I’ll Be Sorry, But It’ll Be Worth It! And a slice for himself he did take. ‘Tis sad but true. (Sad because the limerick is terrible. True because the incident really happened.) Last Friday night my daughter baked a lemon cake to take to her Mom’s Club bake sale, but when she came into the kitchen on Saturday morning, a huge chunk was missing. 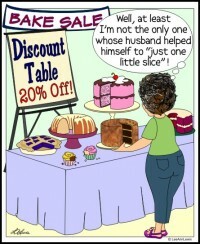 Her husband claims he had no idea the cake was off-limits. She suspects that he knew all along it was probably for something special, but his sweet tooth got the best of him so he helped himself; figuring he’d just apologize later – as in "It’s easier to get forgiveness than permission”. Much as I hate to admit it, this practice and I go way back. The first year I was married, for example, I was browsing through a junk store when I spied an old wooden barrel. Immediately I thought "What a darling little end table this would make!” It was only five dollars, but at the time my husband and I were living on less than three hundred a month, so five bucks was an extravagant sum. Nevertheless, like Daniel and the lemon cake, I absolutely had to have that barrel, so I bought it, figuring – you guessed it – that it was easier to get forgiveness than permission. Don’t worry; everybody does this sort of thing at one time or another. The question is, why? I think it’s because whatever it is that’s tempting us is usually a dumb idea and we know it; but our desire to do it, or buy it, or wear it, or eat it, or you-name-it is so strong that it completely overrides our gut instincts. Ignoring that not-so-still, not-so-small voice screaming, "You’ll be sorry!” we seem perfectly willing to encounter all manner of trouble down the road for the sake of a little bit of pleasure right this minute. We’d be so much better off if we could just calmly and firmly tell ourselves no, right from the start and walk away from it. But how do we do that, when we want what we want so badly? I wish I had the answer to this age-old human dilemma. Alas, all I can offer is this quote my friend Melanie says she learned while attending a Quaker prep school as a girl: "If you shouldn’t… don’t.” If you shouldn’t… DON’T! I can’t tell you how much I wish I’d never heard it, because now that I’ve got that catchy little truth stuck in my head, it’s cramping my forgiveness-over-permission style, big time! And speaking of forgiveness, next week I’ll be spending a few days with my daughter and son-in-law in Dallas. It’ll give me the perfect opportunity to apologize to Daniel for shamelessly exploiting his weakness just to make a point. I know exactly how to do it too. I’m going to bake him a lemon cake, a chocolate pie, some blonde brownies and a cherry cobbler (did I mention he has a sweet tooth?) and I’ll bet I won’t even have to ask his permission! Search for Oh I Get It! articles similar to "Getting the Go-Ahead After I Went Ahead. Search all articles similar to "Getting the Go-Ahead After I Went Ahead".